Christmas is quite literally now around the corner. Our tree is up, presents wrapped, our favourite Christmas movies on the telly and fruit mince pies cooling on the counter. I have to admit, the older I get the more I love spending Christmas Eve at home with Minou and the hubster, grazing on fantastic food and drinking a special bottle from the cellar. Every year I make a small treat boxes for my coworkers, as a way to say thank you for a fantastic year. I try to make a variety of goodies, but as you can imagine things can get a bit hectic around the holidays, and this year was no exception. Since November I haven’t been exactly sure which way is up or which day it is. It has been cray cray (in a good way) at work in the lead up to Christmas, then there was Turkey Day where the green bean casserole from my previous post was a hit, and before you know it, Christmas is here. So this year it was time to think small and simple. Fruit mince pies are always a hit, but this year there are a few vegetarians and religious restrictions in the team, so I needed an alternative. 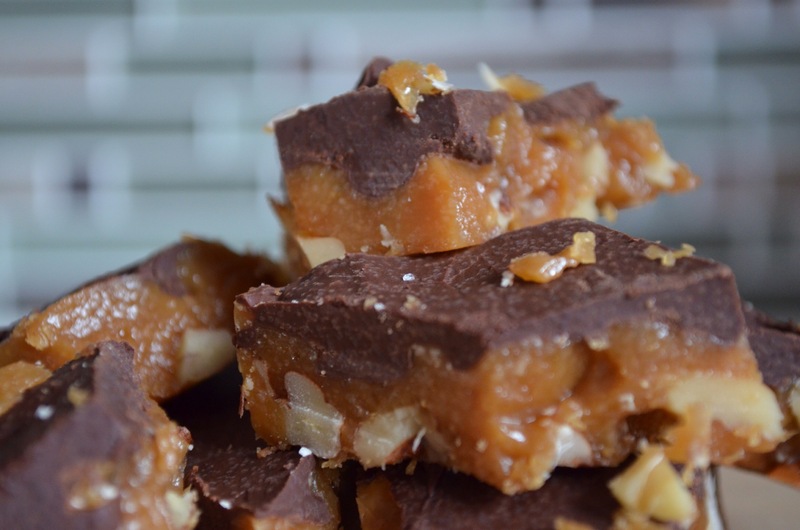 Mom on Timeout’s toffee recipe came through on my Facebook feed in the nick of time. 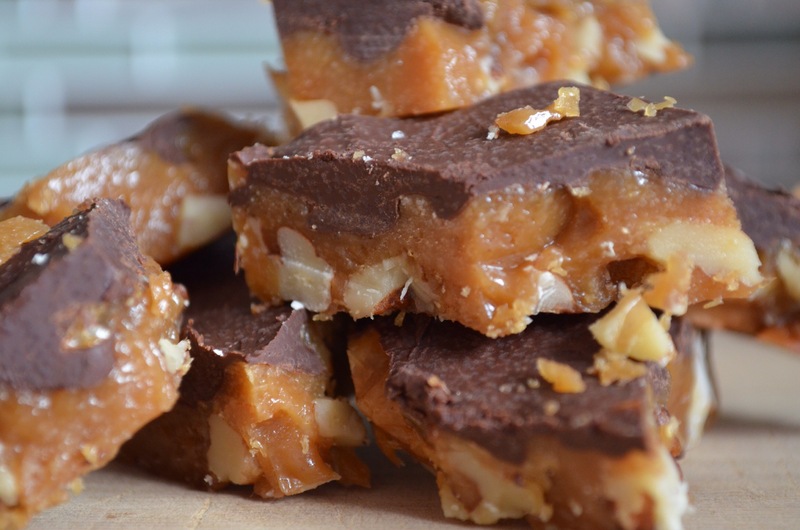 It seemed easy enough to create and plus hey, I love hard toffee. Win win! Here’s my video of the test. Spray a 9-inch (23 centimeter) square baking dish with cooking spray and line with parchment paper. Once the candy is boiling, stir occasionally, slowly and evenly, until the candy has reached 290F (143 Celsius) to 300F (148 Celsius), or “hard crack” on a candy thermometer. I’ve actually never made toffee, so this was an exciting challenge for me. The recipe seems really easy, just a matter of dumping in ingredients and letting them bubble away. What could possibly go wrong with that? Yeah….the first test was a fail. Absolute epic fail. The toffee split when it hit about 250F, making the brown, curdled gluggy mess. I had no idea what I had done wrong! After doing some research there’s a few possibilities. Stirring too hard and too often- This I think is the most likely reason. Stirring too hard could possibly cause an abrupt temperature shift, which is a big no no for toffee. Increasing or decreasing heat too drastically could also cause this. I’ll admit I was very gentle stirring this bath, and I was using a whisk, so maybe while whisking too hard, I added too much cool air and just the force of my whisking caused it to split. Using a cheap saucepan that doesn’t distribute heat properly – Yeah nah. That’s definitely not me! Scanpan and Le Creuset all the way! 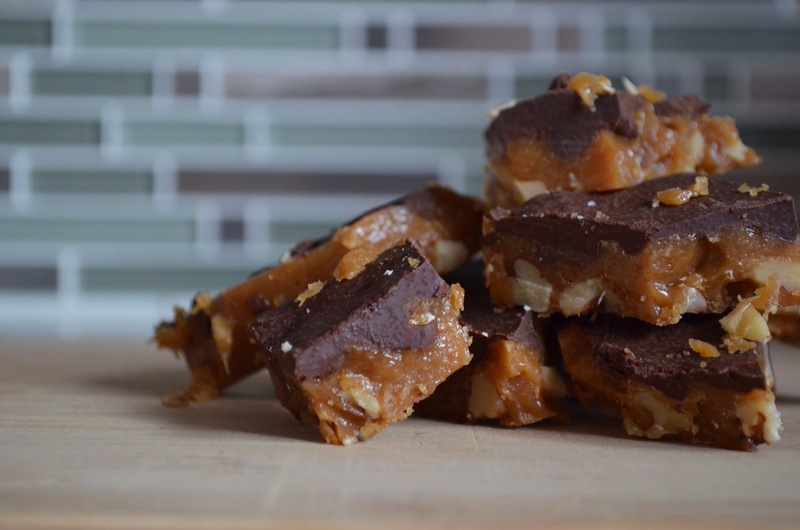 Humidity – water and fat don’t mix, so if it’s too humid in your kitchen this could also cause your toffee to split. So with the second test I made sure to not stir the pot too much and too vigorously. And that certainly helped me get a successful toffee! Woohoo! My dentist is going to love me the next time he sees me! There area few things with this recipe I would change. It’s not the ingredients, but more the order of adding ingredients in. I would add the vanilla in at the very beginning with the sugar and butter, as it does splatter around in the hot pan and also to prevent any drastic temperature changes in the toffee. You’re not putting much vanilla in, but let’s just air on the side of caution and safety. Nobody likes burnt fingers, hands and faces. I would also use a 9 x 13 inch pan instead of a square 9 x 9 inch pan. I like my toffee a bit thinner instead of thicker chunks. But hey that’s just my personal preference, you are welcome to do what you wish! Mom on Timeout also uses milk chocolate chips, but considering how sweet the toffee already is I used semi sweet chocolate chips in the second test to cut through the sweetness a bit. But again you’re welcome to try either milk or dark, or maybe a combination of both if you prefer! Spray a 9 x 13 inch (23cm x 33cm) pan square baking dish with cooking spray and line with parchment paper. Once the candy has reached 290F-300F, carefully pour the mixture over the chopped pecans. Sprinkle the chocolate chips over the top and let sit for 5 minutes or until the chocolate has softened. Gently spread the softened chocolate into an even layer. An offset spatula works best for this. Did my coworkers like the toffee? Considering it was very quiet in the office as they munched on it, I reckon they did! From my family to yours, have a wonderful Christmas and a fantastic New Year, full of cheer and goodies!